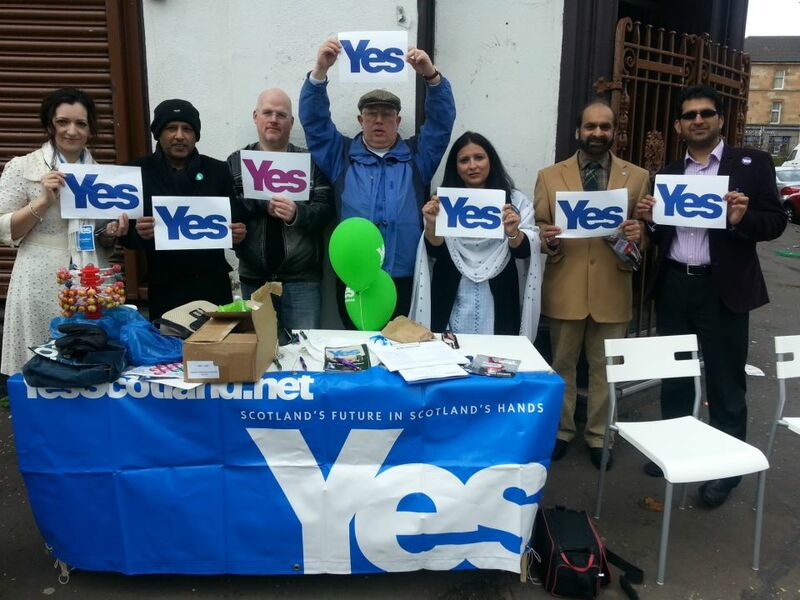 Jonathon Shafi from the Radical Independence Campaign on why he is voting YES! Today I was invited to take part in the Radical Independence Convention workshop for peace, to talk a little bit about my own experiences and interpretation of foreign policy, Scotland and Islam. I spoke alongside MSP John Finnie, Neil Davidson and Isobel Lindsay, who have been campaigning for peace for a very long time, with Neil discussing the imperialist mindset from a historical perspective and how it is embedded in Scottish history as well as UK wide. As a woman of Pakistani descent and a Muslim, born in Birmingham but living here in Scotland for over 27 years -, I have my bit to say about the impact of foreign policy on Scottish Muslims from my own personal experiences, having reached the ripe old age of 46! 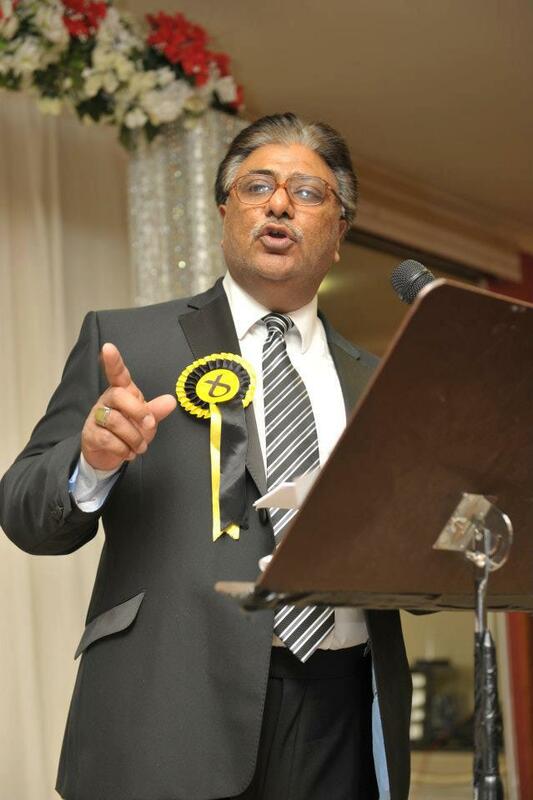 I won’t speak on behalf of the many millions of Muslims around the world or even make a statement that I represent the views of the Muslims in Scotland. This is about how I interpret what is going on in the world around me. I will discuss how I see the effect of foreign policy from a British perspective before contrasting it with the way Scotland is conducting itself on the world stage before finishing with how I see us as Muslims needing to be more proactive in our roles as citizens in Scotland. I do not believe in war. I cannot condone mass murder of our men and women – they are our hope and aspiration for the future. If our politicians are so passionate about putting what they see as ‘wrong’ to rights, they can go and deal with business themselves – I find it difficult to sleep sometimes thinking that some young lad is lying injured or dying in the name of his country. It doesn’t matter what the reason for the call to war is, it is always the person on the bottom rung, the foot soldier that is sacrificed. It doesn’t make me proud – sad in fact. Another life wasted, for nothing but a government’s ego in the name of patriotism, and a medal for those they leave behind. Each foreign policy when used to invade another country in recent times, when deconstructed cannot stand up to public scrutiny. I for one, feel ashamed, and had adopted an ostrich in the sand approach – the problem was far too big for me to deal with, and if I pretended it didn’t exist, I could ignore it – but for how long? From 1990 to 2001, economic sanctions were levied against Iraq for invading Kuwait. These sanctions included food, baby milk and medicine which resulted in the death of over half a million babies and infants. It led to the crumbling of the infrastructure of Iraq, and huge malnutrition amongst the population. Where the American Secretary of State, Madeline Albright was made aware of the facts, she was quoted as saying ‘it was worth it’. How can you ignore that wherever the USA goes to save us from another despotic regime in the Middle East – Afghanistan, Iraq,- Britain blindly follows, even making up false evidence of Weapons of Mass Destruction to give themselves credibility to invade another country. How can two wrongs ever make a right? Explain to me, how the deaths of 3000 innocent individuals in the Twin Towers attack condoned the invasion of Afghanistan and the resulting deaths of over 15000 innocent civilians. Where over 50,000 tonnes of explosives were rained over the skies of cities and towns in Afghanistan. I don’t even want to break it down into a comparative of what one Western life is worth in comparison to a Muslim one. In Iraq the death toll is over half a million. BUT that’s ok because the British found the Weapons of Mass Destruction and a price had to be paid, DIDN’T it? NO? Oh, I forgot,no weapons were found and a simple apology suffices those in the Middle East and beyond – so what are British troops still doing in these countries? Peace keepers – the irony of that statement! Where our countries go hand in hand with organisations such as NATO, condoning policies such as drone bomb attacks, where there are far too many accidents of far too many civilians, children in school, wedding parties – how did the NATO bombers identify terrorist activity in these places? And again a simple SORRY is meted out several months later, after ‘an investigation’. Off course that makes all the families that lost loved ones, their sons, daughters, brothers, sisters, parents and partners feel so much better – SORRY. Could we even for one minute imagine the horror of picking the body parts of our loved ones to try and assemble them for a burial? I am proud to see the good work that Scotland is doing as a devolved nation and soon to be an independent one. Proud to see that we do see ourselves as a huge civic movement that values all life and has active foreign policies which invest in projects in all the continents across the globe, to improve our relationships and trade interests and create synergies for further growth at home and on the world stage. We chose to invest in people, irrespective of their wealth or where they come from, whether that is Malawi, Pakistan, India, Dubai or China, East European countries such as Poland, – we help them to learn about sustainability, empowerment, and growth as communities. We are more than happy to share our knowledge and our skills with our neighbours across the world. It identifies how we see ourselves and how we are seen. 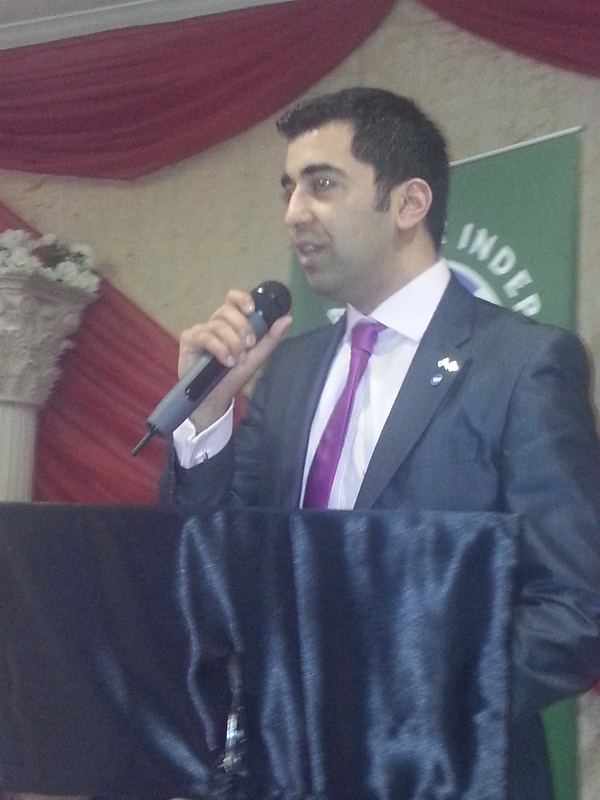 With such inspirational role models as Humza Yousaf, Scotland’s very own Minister for International Development and External Affairs, we are shown the way it is in Scotland and how we can only improve upon this as we move forward to independence. How can we as Muslims complain about our rights, our freedoms, our collective future, if we refuse to engage in the political process across the board as active Scottish citizens? We have an obligation as Scots and Muslims to fully participate in local and national debates, and not come out in public, to issue an apologist statement when another terrorist attack occurs in the name of Islam. Enough! We have allowed ourselves to be defined by foreign policy and events in the Middle East for far too long. Enough of the navel gazing and victim mentality. We make a positive contribution to Scottish society. It’s time to let the people, press and politicians know that we are as Scottish as we are Muslim and we care about our shared future. And only by working together as one nation can we put a stop to mass murder. We can only do this if we are completely in charge of our own foreign policies as an independent country. Let me finish with a small quote from Martin Luther King. We have flown the air like birds and swum the sea like fish, but have yet to learn the simple act of walking the earth like brothers. Let an independent Scotland show us the way! “We are starting in the days where there is no discrimination, no distinction between one community and another, no discrimination between one caste or creed and another. We are starting with this fundamental principle: that we are all citizens, and equal citizens, of one State” Muhammed Ali Jinnah – Founding Father of Pakistan. Solidarity with Christians of Pakistan killed in another cowardly attack. These same feelings were expressed by others in the political community, especially Councillor Shabbar Jaffri, who is one of the more high profile and passionate speakers about the injustice and senseless murders of Shia Muslims in the Middle East and Pakistan. This sectarian and mindless killing has to stop. Prayers for peace in the world.